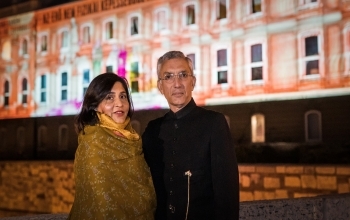 Celebration of 150th Birth Anniversary of Mahatma Gandhiji continued in the evening when the historical Buda Castle was lit up with the Life and Teachings of Mahatma Gandhiji and with his favorite bhajan "Vaishnav Jane Toh" played in the background at Vigado tér. H.E. Rahul Chhabra, Ambassador of India was happy to see the excited crowd who gathered to see this magnificent celebration.